Citation Information: J Clin Invest. 2014;124(2):604-616. https://doi.org/10.1172/JCI71017. The loss of orexin neurons in humans is associated with the sleep disorder narcolepsy, which is characterized by excessive daytime sleepiness and cataplexy. Mice lacking orexin peptides, orexin neurons, or orexin receptors recapitulate human narcolepsy phenotypes, further highlighting a critical role for orexin signaling in the maintenance of wakefulness. Despite the known role of orexin neurons in narcolepsy, the precise neural mechanisms downstream of these neurons remain unknown. We found that targeted restoration of orexin receptor expression in the dorsal raphe (DR) and in the locus coeruleus (LC) of mice lacking orexin receptors inhibited cataplexy-like episodes and pathological fragmentation of wakefulness (i.e., sleepiness), respectively. The suppression of cataplexy-like episodes correlated with the number of serotonergic neurons restored with orexin receptor expression in the DR, while the consolidation of fragmented wakefulness correlated with the number of noradrenergic neurons restored in the LC. Furthermore, pharmacogenetic activation of these neurons using designer receptor exclusively activated by designer drug (DREADD) technology ameliorated narcolepsy in mice lacking orexin neurons. These results suggest that DR serotonergic and LC noradrenergic neurons play differential roles in orexin neuron–dependent regulation of sleep/wakefulness and highlight a pharmacogenetic approach for the amelioration of narcolepsy. Region-specific restoration of orexin receptor expression in Ox1r–/–Ox2r–/– mice. 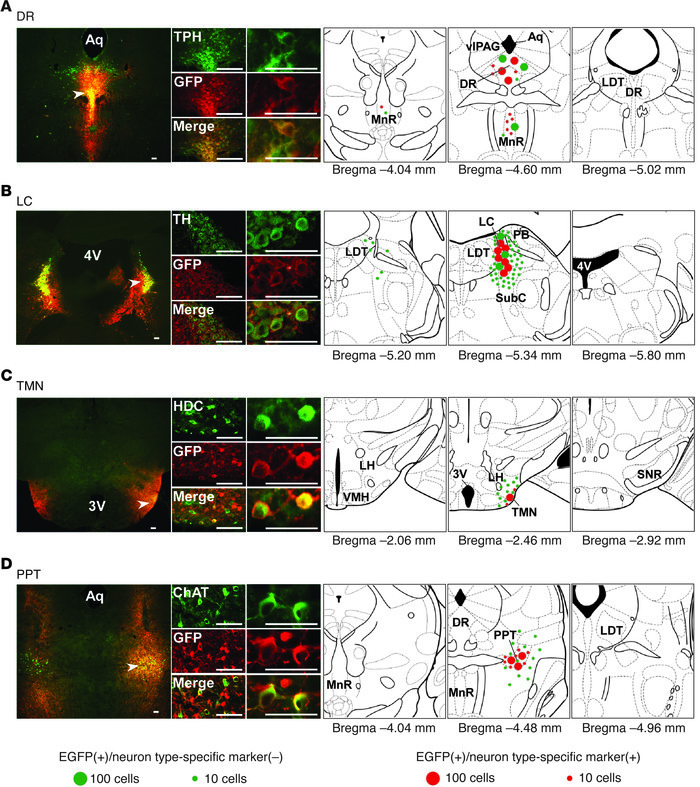 Coronal brain sections prepared from Ox1r–/–Ox2r–/– mice with targeted injection of AAV-EF1α/OX1R::EGFP (B and D) or AAV-EF1α/OX2R::EGFP (A and C) were double-stained with anti-GFP (red) and the neuronal type–specific marker (green) antibodies TPH (A), TH (B), HDC (C), and ChAT (D). Regions denoted by white arrowheads are shown at higher magnification. Schematics show the spread of OX1R::EGFP or OX2R::EGFP expression. Mean numbers of EGFP+ cells are shown by green or red circles, indicative of the absence or presence, respectively, of the neuronal type–specific marker. For bilaterally injected areas, only 1 side was shown. 3v, third ventricle; 4v, fourth ventricle, Aq, aqueduct; SNR, substantia nigra pars reticulata; VMH, ventromedial hypothalamus. Scale bars: 100 μm.